At 5895 metres (nearly four miles) above sea level, the summit of Mount Kilimanjaro is the highest point on earth to which you can walk. This is a mountain of contrasts and extremes. You start from tropical rain forest and finish in arctic conditions, passing through a landscape formed by ice and fire. Yet any well-prepared walker with enough determination may be able to climb Mount Kilimanjaro, to reach ‘the roof of Africa’. To climb Mount Kilimanjaro, the greatest challenge you face is the huge altitude gain. The author’s advice on preventing altitude sickness is based on medical research, and on her own experience of successful ascents by four different routes, as well as experience of trekking at altitude on four continents. 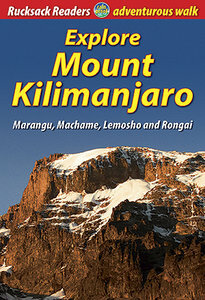 The fourth edition of Explore Mount Kilimanjaro has been fully updated to cover the Lemosho/Shira routes. - full colour throughout, with over 70 photographs.